How sweet! Your design works perfectly with the color scheme, love that little sunshine. Thanks for joining us at Fab Friday, hope to see you again soon! Great colour combo and use of the sketch. Thanks for joining us at Mojo Monday! Perfect colors to use with this stamp set! Like the sweet polka dots with the scallop circle...great card to send for a hello! Thanks for sharing at Fab Friday! So fresh and cute! Love the sunshine stamp with the layered circles, and how can you go wrong with polkadots! Just darling with these colors! Fresh and fun and so pretty, Jennie.Love it! Thanks for playing along at the Fab Friday challenge. 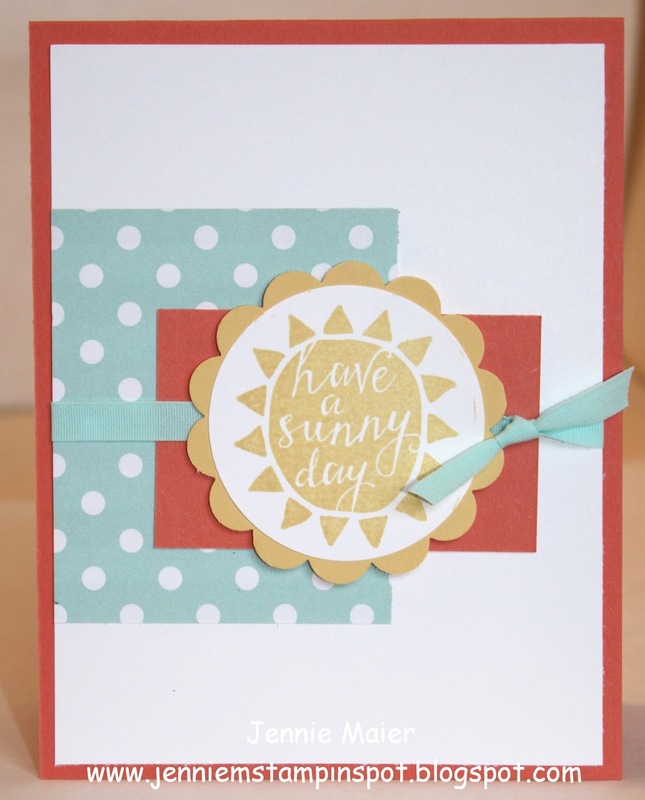 I love this happy sunny card! Your color details are so fresh and buttoned up! Thanks so much for playing at Fab Friday! Great card, Jennie! Wonderful layout for these images and colors! Thanks for playing along with this FabFriday color challenge!